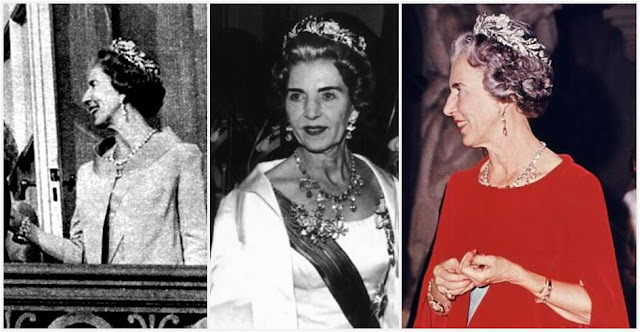 No Week of Margrethe would be complete without a look at one of her favorite tiaras (also a favorite of several of you, dear readers, judging from your requests), the Floral Aigrette Tiara. This one could - and does, depending on who you're talking to - go by several different names: the wreath tiara, the diamond floral tiara, the three piece tiara, whatever else you want to come up with. It is a diamond tiara in a floral motif that comes in three separate sections; the center section has a little more character to it and features the largest flower, which is skillfully mounted en tremblant so that it will tremble slightly with movement, increasing the sparkle. The two side pieces have more of a wreath-style design. You can wear all three together mounted on a frame in traditional tiara mode, or you can wear any number of the pieces in various formats. The pieces on their own can be used rather like aigrettes, hence the name I'm using for this piece. The provenance of this piece is still a little bit mysterious. It's often said to have been bequeathed to Queen Ingrid from a wealthy Danish-American sometime in the 1960s, but according to Queen Margrethe in De Kongelige Juveler it was purchased by King Frederik IX, Ingrid's husband. It was sold by opera singer Lauritz Melchior, a fact reported in a Danish newspaper in 1963, which stated that it was sold through Danish firm A. Michelsen and was purchased by King Frederik. It's also said to date from around 1850 and was owned by Frederik's maternal grandmother, Grand Duchess Anastasia Mikhailovna of Russia, Grand Duchess of Mecklenburg-Schwerin (mother of Queen Alexandrine). If the Russian connection is correct, it certainly offers a larger motive for the purchase. 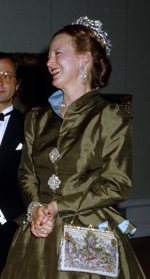 Ingrid debuted the piece at Margrethe's wedding in 1967, where she paired it with the magnificent diamond demi-parure belonging to the Danish crown jewels (this is the picture of Queen Ingrid on the left above). Ingrid wore all three pieces on a frame as you normally would wear a tiara. Her daughter Queen Margrethe first wore it in the 1980s in the same fashion, but soon took it apart and started to get creative with the three pieces. 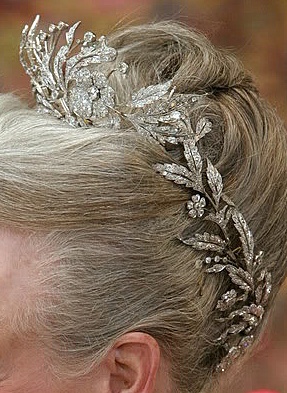 Margrethe wraps varying numbers of the tiara's pieces around her signature updo, and sometimes she stands the center piece up on top when using all three. Adding or subtracting pieces allows her to customize the grandness, if you will, of her appearance to the occasion at her own whim: more pieces is great for a very formal event, while fewer pieces are well-suited to a black tie celebration (though she certainly doesn't stick to any set rule). She and her hairdresser have fun with it; it's the perfect toy for a creative queen. My personal favorite appearance of this tiara was at the wedding of Crown Prince Frederik and Mary Donaldson in 2004, for two main reasons. First, the symbolism: she carried on the tradition started by her mother, wearing the tiara plus those giant crown diamonds for the heir's wedding. Second, the appearance: it may look from the front as though she has a modest diamond diadem on, but from the sides and back the diamonds are wrapping nearly her whole head like the grandest wreath that ever was. A perfect way to be the queen on someone else's big day. What's not to like about this piece? I certainly understand why Queen Margrethe trots it out as often as she does. Even if floral tiaras aren't your favorite (they're not my favorites, honestly), the flexibility here is hard to beat. Where does this fall on your list of favorites?